The U.S. economy added 211,000 jobs in November, a solid boost that likely means the Federal Reserve will raise interest rates later this month. The jobs gains exceeded expectations. 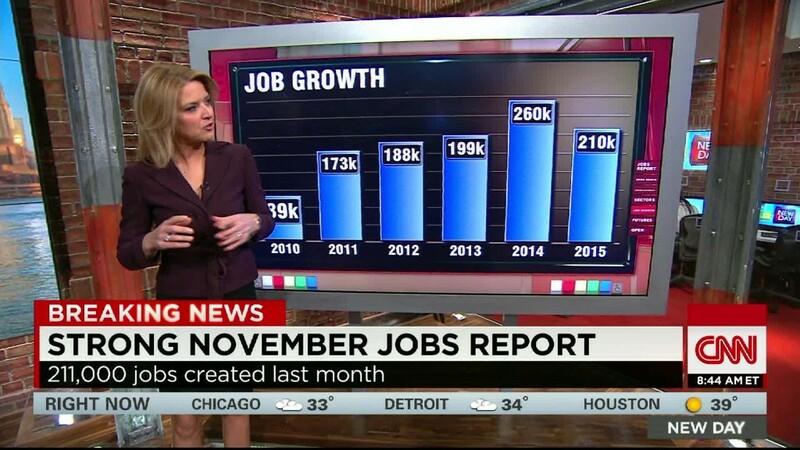 Economists surveyed by CNNMoney predicted there would be 192,000 jobs added. The unemployment rate stayed steady at 5%, its lowest level since 2008. Strong hiring is a reassuring sign of a healthy job market. There were concerns that job growth was slowing over the summer, but October was the best month of job gains this year, and Friday's news keeps the momentum going. "October and November have bounced back so strongly," says Phil Orlando, chief economist at Federated Investors. Those gains "really erase the stench of that August and September mess." In fact, October's job gains were revised up to 298,000 jobs added from 271,000 jobs. Even wages are finally starting to show signs of life. Average hourly earnings rose 2.3% in November compared to a year ago. That's not as good as wage growth in October -- which hit a 6-year high -- but it's better than wage growth earlier this year. The big winners in November were construction, health care and business services. Construction added 46,000 jobs, while health care and business services each gained over 24,000 new positions. This month's jobs report is very important for the Federal Reserve. The Fed's committee meets on December 15-16, and it could raise its key interest rate for the first time in nearly a decade. Rates have been stuck at zero since the financial crisis in 2008 in an effort to boost the economy. That stimulus no longer looks necessary. The November jobs report was the last major hurdle for the Fed. The solid hiring appears to clear the way for a rate hike. "There's almost a certainty that the Fed is going to raise interest rates in December now," says Andrew Chamberlain, chief economist at Glassdoor. "The job market still has a lot of steam and the Fed should be comfortable raising interest rates." Stocks rallied Friday morning, a sign that investors may be ready for the Fed to "lift off." Fed Chair Janet Yellen summed up the importance of the first rate hike in a speech Wednesday. It "will be a testament...to how far our economy has come in recovering from the effects of the financial crisis and the Great Recession," Yellen said.